Socialist Party MEP Paul Murphy said earlier he didn’t believe people would be bothered that he put up his posters before he is legally allowed to do so. But one local authority has asked that he take them down. 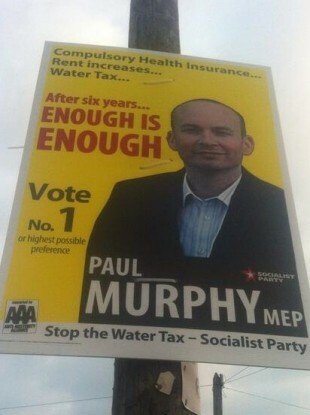 SOCIALIST PARTY MEP Paul Murphy has been forced to take down some of his election posters after he erected them before he was legally allowed to do so. Dún Laoghaire-Rathdown County Council has told Murphy he must remove posters but has not told him if he faces being fined for putting them up early. The Dublin MEP, who is seeking re-election to the European Parliament on 23 May, had been spotted putting up posters around the capital this weekend and confirmed this morning that a few hundred had gone up in the last 24 hours. TheJournal.ie has received dozens of reports of candidates’ posters being prematurely erected in the last 24 hours with Murphy prominent among them. Those running in the local and European elections are not legally allowed to erect their election posters until tomorrow with many set to scale lampposts across the country at around midnight tonight. Murphy said that only authorities in Dún Laoghaire-Rathdown have so far told him to remove the posters in its area. Earlier, the MEP defended his decision, saying it was a response to rival Fianna Fáil candidate Mary Fitzpatrick putting up posters over the weekend - a move she said was a result of new volunteers. Murphy’s decision means he is in breach of Dublin City Council protocols and the Litter Pollution Act 1997, putting him at risk of fines of up to €150 for each poster. But he said he does not expect to receive a large number of fines, nor does he think it will bother voters when they go to the polls. Murphy said that the Socialist Party is not one of “law and order” citing examples where it has broken what it believes are “unjust laws” although he said this does not apply in this case. Email “MEP who didn't think 'people would be bothered' forced to take down election posters”. Feedback on “MEP who didn't think 'people would be bothered' forced to take down election posters”.